The high vol and low correlation of Bitcoin make it quite interesting. What are the mechanics of trading Bitcoin? On which venues can you trade, and do you need a wallet, or can you store it differently? Are there any funds trading it? I don't know why but it kind of reminds me of the tulip bubble, technology improvements aside. I haven't seen this topic in our forum before - so I'll add a bit to start a discussion. @Tradenator - do you really think it's just a bubble? a-2) There is finite number of bitcoins out there - which is a unique feature. b) It's somewhat tied to computational power, since mining bitcoins in a computational exercise. c) While thinking of BitCoins as currency is hard - but it does seem to be an asset, like gold, or even more like an art piece - it's value depends on how many people like it/want it. @NeroTulip - I don't know of any funds trading it. I know that a german bank Fidor allows clients to buy/sell/hold them already on their platform. Mechanics: you buy bitcoin from someone, and its owneship gets transfered to you. "do you really think it's just a bubble?" I sat in a room (drinking, so I didn't kill anyone) with one of the Satoshis (smart guy: now working on a better idea), 3/4 of paypal's founders, the owners of two of the exchanges, founder of an ASIC mining company, a couple of VCs, and the Winkelvoss entity (nice guys; I hope they cash in). It's a bubble. A few of the exchanges are legit, in that they are not overt criminal enterprises. They also don't know what they're doing. It's all written in node.js. Imagine 90s era nasdaq ... written in node.js. They don't really have exchange rules, don't understand that market making is good for business (one of the exchange owners went into great and prideful detail as to how he'd prevent MM's from trading on his exchange), and don't understand things like "BBO," to say nothing of "deflation." In the run-up to the first big bubble pop in April or whatever, I contacted some of these guys. At the time, they didn't even know what a limit order was. The underlying technology, distributed crypto DBs, is a decent one which could have many legitimate applications. The implementation is dumb. The utility of BTC as money is marginal. It takes hours to transfer money (Visa does it in seconds; even Western Union or Moneygram is quicker and cheaper), and fraud is trivial. None of these guys seem to have thought of the fact that a bitcoin exchange is a defacto money laundering operation, or, it's regulated by the government the same as Western Union, and so, not very interesting. If you had the conversations I had with those people, you could come to no other conclusion than "dumb bubble." Seasteading was mentioned at some point. This made me wish I had availed myself of Silk Road before I arrived. 1 (consider it an axiom). in real economy, cash should grow hand-in-hand with asset growth. not sure how tangible these assets must be. any deviation of cash-mass from assets upwards will lead to bubble, which will increase the likelihood and the scale of down-correction the longer it takes. 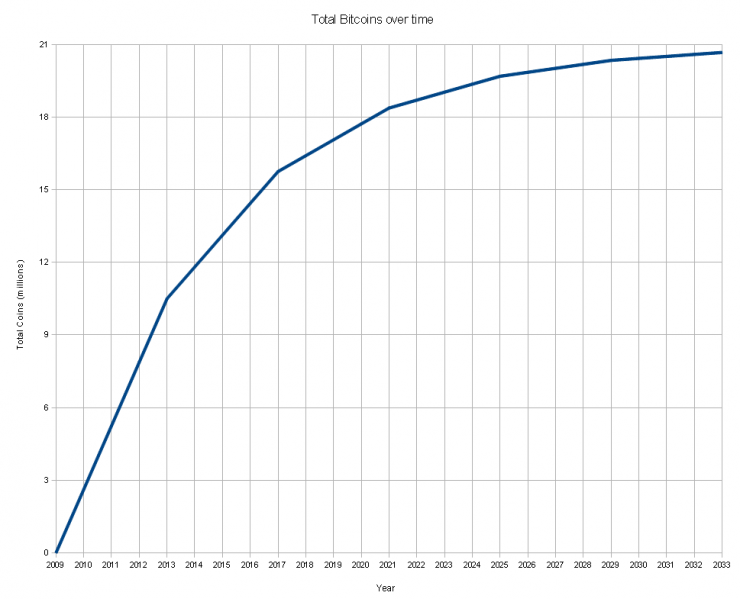 2. bitcoin production (mining) is deterministic function, steep at the beginning and flat at the end . Therefore, at the end of this curve the growth of assets coupled to this bitcoin cash should stop (indeed, if it still grows it would be more profitable to invest into bitcoin and do nothing because bitcoin itself becomes an asset loosing its wealth-transfer function). 3. currently, BC is in the regime where the bubble is still possible. the regime when bubble will be not possible will be around the time when growth rate of amount of BC will be equal to the growth rate of assets, i.e. due to real economy money transfer and not due to pure trading. I think, critical points will be 2021,2025,2029 (more likely at 2025). what you describe is "weak clearing mechanism" as defined by H.Minsky, which moves my 2025 crash to even closer date... 2021 or maybe 2017? JSlade - "one of the Satoshis"? You've piqued my interest. There's more than one? What's the scoop, dude? -Extremely inefficient market, the market participants are fairly unsophisticated. -Poor implementation, like jslade mentioned exchanges are coded in node.js and ruby. It's like a bunch of tech guys got together with no domain expertise and hacked together an exchange with the flavor of the week language (actually I bet that's exactly what happened). -Lack of high resolution data, the last time I checked there wasn't much data available. -Highly capacity constrained, might be suitable for PA (this may have changed since the last time I checked, but I wouldn't count on it). -High transaction cost BTC/USD quoted around 25 bps wide, with commission being all over the place. The only exchange who offered liquidity rebate was shutdown. -Counterparty risk (exchange), there's both regulatory as well as technology risk with these guys. The largest exchange hasn't been redeeming cash recently but will allow you to deposit - not a good sign. My conclusion was that it might be alright to trade this market in your PA, but the overall amount of work involved might not be worth the payout. The exchanges really need to get it together..
--You do need a wallet to store your Bitcoins, but interestingly, there are "paper" wallets that you can use. --Many of the exchanges are not even legal entities, and are simply started as side projects by people who have some programming knowledge and a passing interest in Bitcoin. When these exchanges shut down (either due to legal reasons, lack of interest, or because the operator is a thief), your money may or may not be returned to you. This is significant, as a large percentage of exchanges do end up shutting down -- 45%, if you believe this article: http://arstechnica.com/business/2013/04/study-45-percent-of-bitcoin-exchanges-end-up-closing/. It sounds like roulette to me, but again, I've never used it before, and I'm far from an expert on the subject. Am I right in saying that the proof of ownership of a particular bitcoin is the list of previous transactions with that bitcoin, back to a mutually-agreed-upon reference point? I.e., it's like a proof of title for real estate? So the anonymity is only available to the extent that the user hashes in the title document can't be linked to IRL users? Besides what's been mentioned, I think a vulnerability is the reliance on SHA256. I couldn't find a path forward for bitcoin in the event a break is published. I think another interesting question is whether crypto hash functions in general are hardened against finding hashes within a certain range. It's not 100% obvious to me that resistance to collision finding (==) necessarily implies resistance to range finding (<=). Before diving in the financial mechanism or the technology side of this "idea", it's hard to see how this "currency" can be legal - in itself - in any country. The fact that you need a broker to interface between "real world" and "bitcoin world", and the real world involves regulated means of exchange/currencies is in my opinion what makes the scheme illegal. "The USA Patriot Act, passed in the wake of the September 11 attacks more than five years after e-gold had been launched, made it a federal crime to operate a money transmitter business without a state money transmitter license in any state that required such a license" as mentioned in the Wikipedia page on egold. "The money laundering charge mentioned by jslade will just be a way (out of many) of insuring the shutdown once this happens"
To be fair, one of the legit "exchanges" has thought about this, a lot, and the investors are too. But the upshot is, that exchange restricts its transactions to "institutional investors." They don't actually do the "moneygram" part of BTC which is what gives it economic utility; it's just for speculators. I guess the CFTC is less scary than treasury, but anyway. From a pure legal point of view, if "bitcoins" are to be considered an investment, what is the "asset"? (1) As there's no physical asset, or contract on an asset (a derivative) - I can see how this "investment" would be considered a fraud. (2) If the "asset" is a means of payments, and someone offers you a number of these units of payments vs. "real world" currency, so that someone else can convert back this fictious asset to real world currency, I'm pretty sure prosecutors would call that process a potential back-to-back "anonymiser" operation with no economic value (or laundering in other words). I keep calling it a fictious asset, because unlike fiat money - which is also "fictious" - it lacks legal backing, or the necessary promise that some entity owes you something. To answer the original question, it seems like SecondMarket is launching a bitcoin-based trust for Qualified Investors. biggest ponzi scheme of the century (although i guess that depends on how you measure madoff), indeed the work of genius. If any of you has a spare 100K to buy server capacity we could probably short it, then DDOS all the entrypoints and most of the exchanges and watch it plummet 50% or so in a few hours.. and with a few mil you probably wouldn't even need to do the DDOS thing. monopoly money has more value to me. >Am I right in saying that the proof of ownership of a particular bitcoin is the list of previous transactions with that bitcoin, back to a mutually-agreed-upon reference point? I.e., it's like a proof of title for real estate? So the anonymity is only available to the extent that the user hashes in the title document can't be linked to IRL users? That is correct. When the FBI got its hands on silk road's bitcoins the whole internet knew what their wallet address was within a day. and they said it was anonymous.. Finally I hear USD -> BTC -> USD transaction fees are like 12%. do not want..
On the legality of Bitcoin, I do recommend Mencius Moldbug's How Bitcoin dies. so you wouldn't advise getting a second mortgage, cashing in my pension and loading up? Seems one to stay well away from. Apart from the problems highlighted by others, any subset of which should cause reasonable people to run a mile, the price action smells like a promotion to me. It's not as if BTC exchanges would have well-staffed compliance and market abuse departments. People can do what they want: trade with themselves, trade amongst colluding groups. There's every chance that there are large vested interests who are long from the early days who could move it around like a puppet on a string. Besides, as others have mentioned, it's not even clear what the underlying is. It's pretty much just a number. What's the number going to be tomorrow? It's like the apotheosis of the joke about trading sardines. Whatever, I'm in as of today and made 5% in 12 hours. I'm putting in less than what I'd take to the craps table. I have a friend who has an ASIC to sell, Steve, you wanna buy? only 3 BTC. It's going to save you roughly three months of waiting in line. Also I think mom has some tulip bulbs somewhere.. Laugh all you want, I'm up 10 %. hmmm IMHO this thread has a mostly wmot-level signal to noise ratio (i will not comment on ponzi schemes, claims of illegality and claimed 12% fees). Think of Bitcoin as pure fiat money with a max money supply at around 20mio units (however it is currently not legal tender anywhere). Basic system is a public blotter which documents movements of coins from wallet to wallet (lots of crypto involved). Think of wallets as number accounts which can be easily generated by anybody. The attractive part is the difficulty of regulating it and the anonymity. If I send BTC from a wallet I control to a wallet you control, the fees are minimal to zero. If you want to get started, checkout e.g. http://bitcoincharts.com/markets/ or http://markets.blockchain.info/ to find an exchange to which you can transfer funds and trade. Fees are typically in order of 25 to 50 bps. As mentioned, many exchanges are of dubious virtue and can get hacked. Regarding legal status, it obviously changes over time as authorities get more or less interested. The German Finanzministerium for example recognized it as a form of private money - this means e.g. that they see trading profits as taxable (if holding period is below one year). Thanks for all the comments. Interestingly, I had not seen this. This market seems pretty fragmented - and there sure is no reg NMS here... At the moment, 1 Bitcoin seems to be USD 599 on Mt.Gox, and USD 522 on Bitstamp. It can't be that much out of whack, can it? If that is indeed the case, what is required to do the arb? I don't think you can short Bitcoins, but if you had a long position on both exchanges, you could trade around it: buy more on Bitstamp, sell on Mt.Gox, and transfer your coins back from Bitstamp to Mt.Gox. That may be the tricky part: is there a fast and cheap way to move your Bitcoins from an exchange to another?